There’s something about retail experiences popping-up in spaces that were previously public thoroughfares that creates an irresistible energy and attraction. The right offer, appearing magically in the path of the right consumer with the right brand proposition and brand identity creates a dissonance for consumers that is both compelling and inspiring. 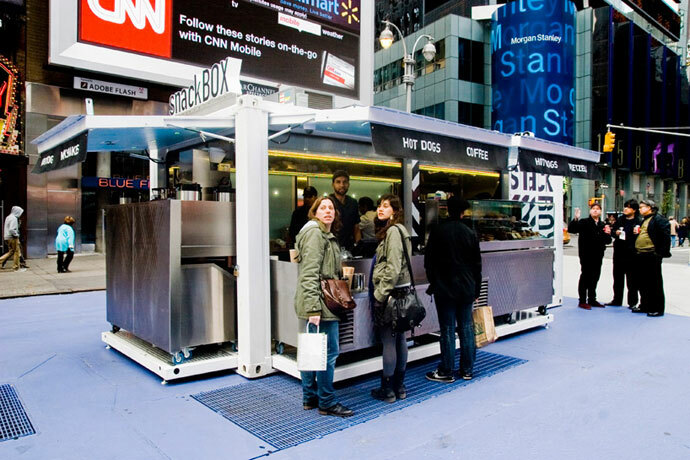 ‘Snackbox’, a shipping container turned modern canteen has recently popped-up in New York’s Times Square. Montreal-based firms Aedifica and Muvbox teamed up to create ‘Snackbox’, created for restauranteur Jonathan Morr, owner of well respected eateries; Republic and BONDST. Snackbox serves-up iconic New York street food with a gourmet flair. The menu is described as “American street food,” featuring hot dogs, pastries, pretzels, coffee, etc. fare typically found at the ubiquitous food carts around NY. 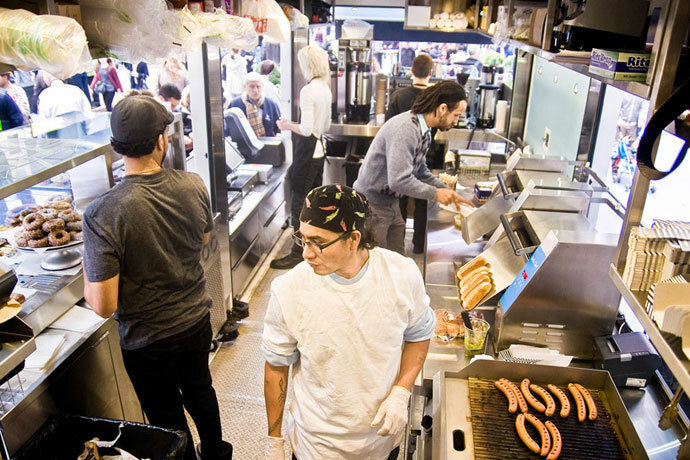 But like all great retail food brands, Snackbox has a specialty – hot dogs. The dogs are all-beef, seasoned and smoked, steamed and then finished on a griddle and served with homemade sauces. Makes my mouth water just typing that. 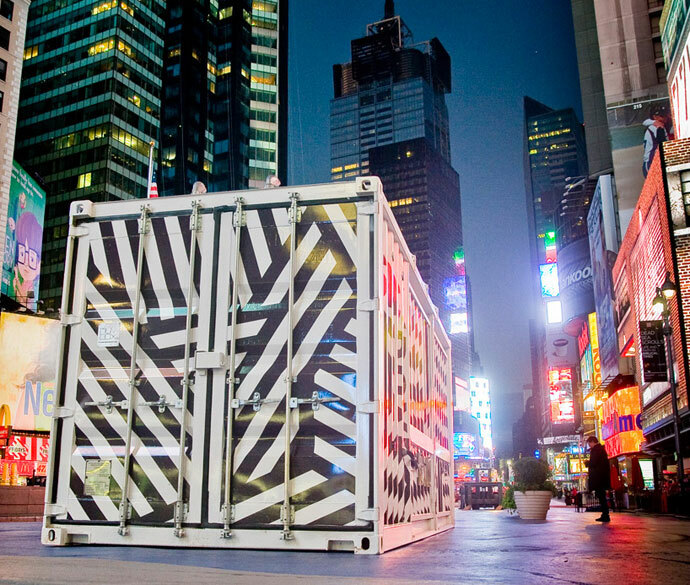 The bold black and white graphics contrast the colorful environment, while the dimensions of the container are just large enough to work as a food vending station. Twenty feet (six meters) long, the box is movable and entirely self-sufficient. Working off the gird, a fresh and grey water supply tank is embedded into the floor. The power comes from hybrid energy systems, combining electric batteries and a generator. In the winter, the recuperating heat from the generator is used to heat the interior for the staff, optimizing the small space. For the service area, the a section of the wall pivots upward, transforming from a closed entity into a bar with an awning. The quick transformation allows the vendor to open and close in minutes.